Options Mandarin Scent, 40ct. Value Pack, Mandarin Scent, 80ct. 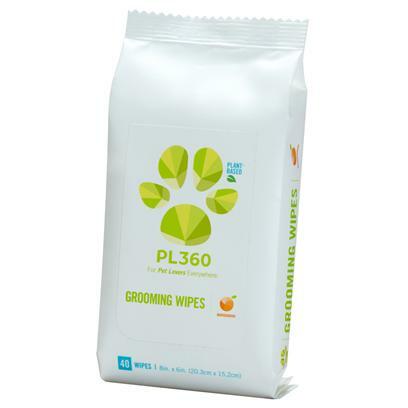 PL360 Grooming Wipes are made with plant-based ingredients to clean and nourish naturally between baths and on the go. they are durable enough to take on muddy paws and claws, but gentle enough to use daily for a burst of freshness. Water, chamomilla recutita flower extract, vegetable oil, glycerin, lauryl glucoside, polyglyceryl-2-dipolyhydroxystearate, glyceryl oleate, dicaprylyl carbonate, sodium benzoate, citric acid, potassium sorbate, solanum lycopersicum (tomato) seed oil, helianthus annuus (sunflower) seed oil, vaccinium macrocarpon (cranberry) seed oil, nigella sativa (black cumin) seed oil, rubus idaeus (red raspberry) seed oil, natural fragrance.